It was the biggest of nights on the sport desks. The win, draw or lose pages were set up in advance and tweaks were made as the night twisted and turned. With 15 minutes to go the zeroes became heroes and then back to zeroes when Luis Suarez, inevitably, put England to the sword. And within minutes of the final whistle, with the adrenaline still pumping and passions running high, the papers were on deadline and the button had to be pressed. So in the heat of the moment, how did they fare? Perhaps surprisingly, the knives weren’t out for Roy Hodgson … not yet anyway. 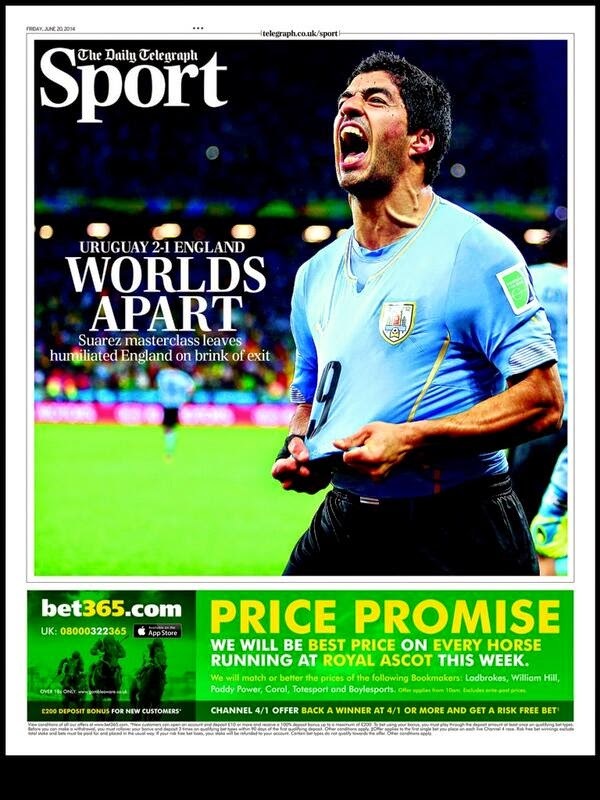 Instead the focus was on Suarez and the faintest glimmer of hope. The Sun is at its creative best. 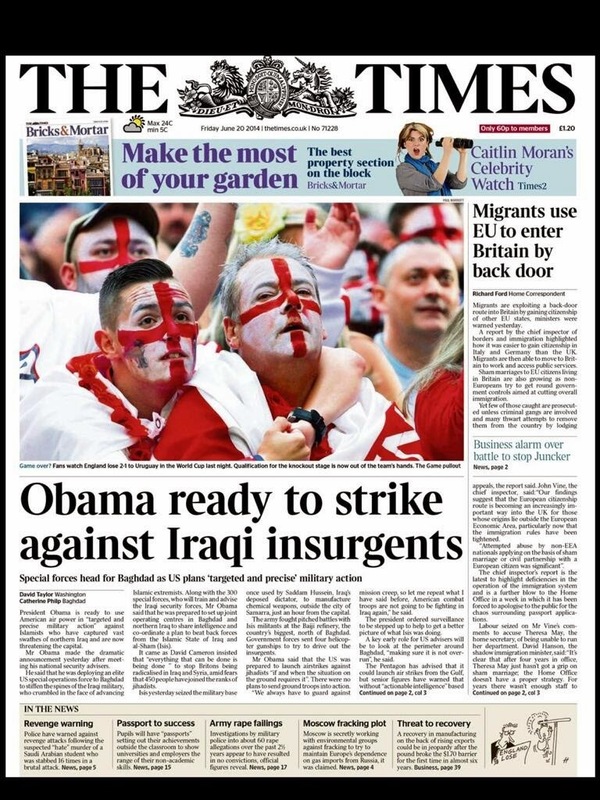 The paper has urged support for ‘our boys’ throughout … and even now it has contrived an optimistic view. 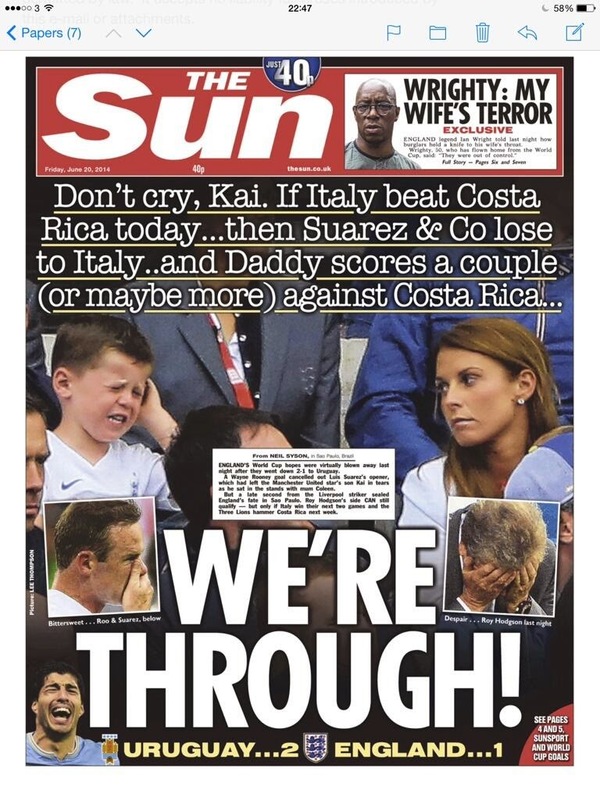 Tying it into the picture of Kai and Coleen is neat (although I have a slight concern about putting the focus on a tearful four-year-old boy) but the insets of Rooney, Hodgson and Suarez less so. The page came in for some stick on Twitter. Not sure why ... The Sun's trademark is to add humour, even in adversity. The back page brings up the old bite theme. Clever headline. The Daily Mail also uses a picture of a grim Kai on Page 1, supposedly telling an inset picture of his dad that it's too late for prayers. 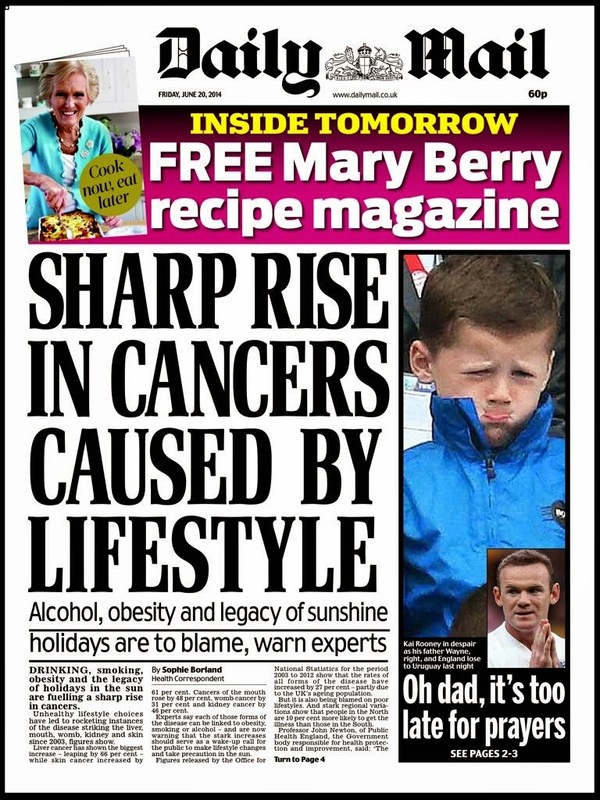 I'm afraid, despite The Sun's tongue-in-cheek stance, it almost certainly is. The back page though, tells it as it is. Just two good is exactly right. 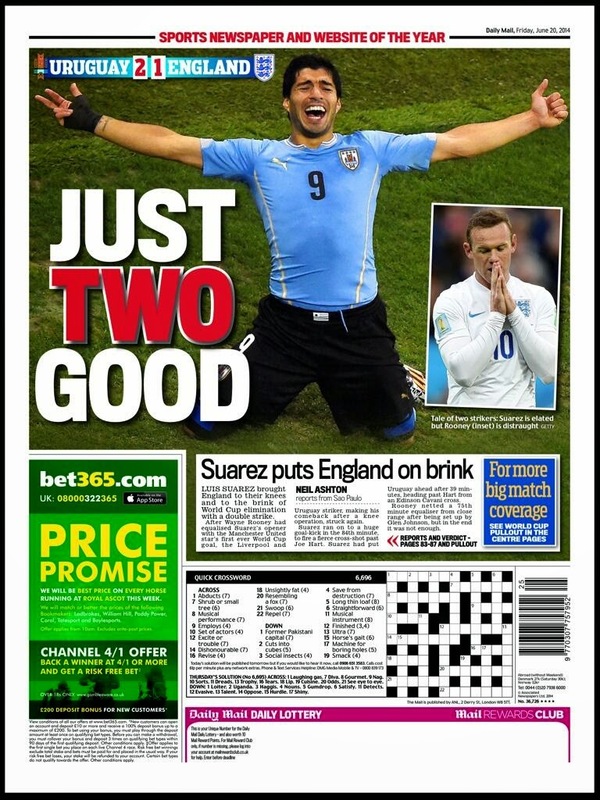 The contrast of a triumphant Suarez and a dejected Rooney says it all. 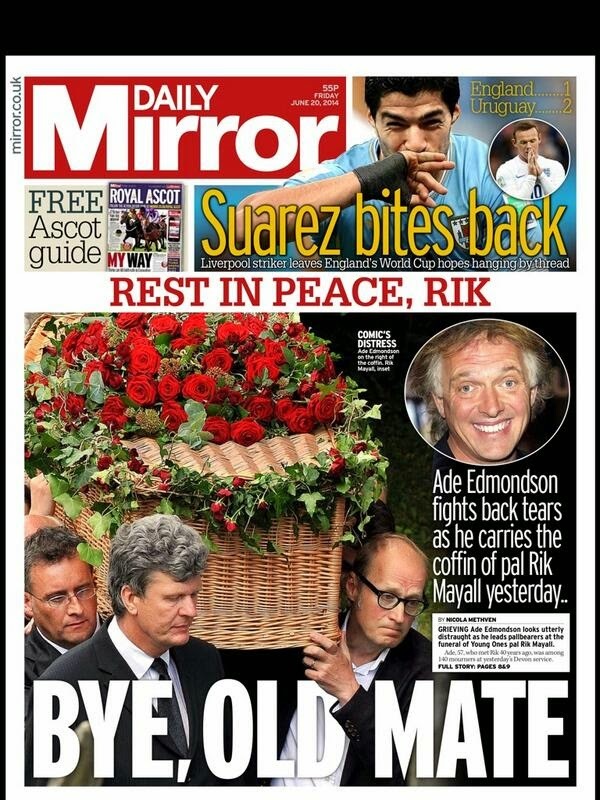 The Daily Mirror's first edition leads on Rik Mayall's funeral, which may change in later editions. 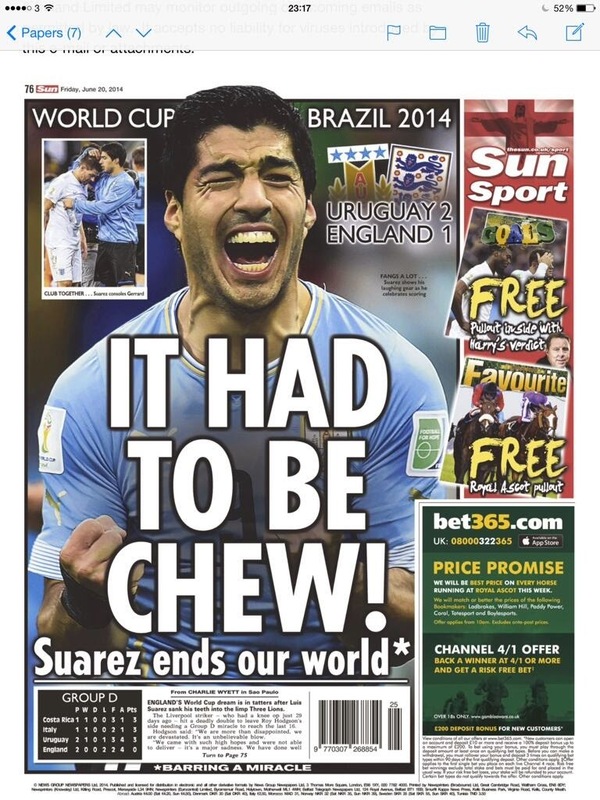 Suarez bites back is a good headline, although the picture is of the Uruguayan striker kissing the back of his hand rather than baring his teeth. The back page is very much more like it ... 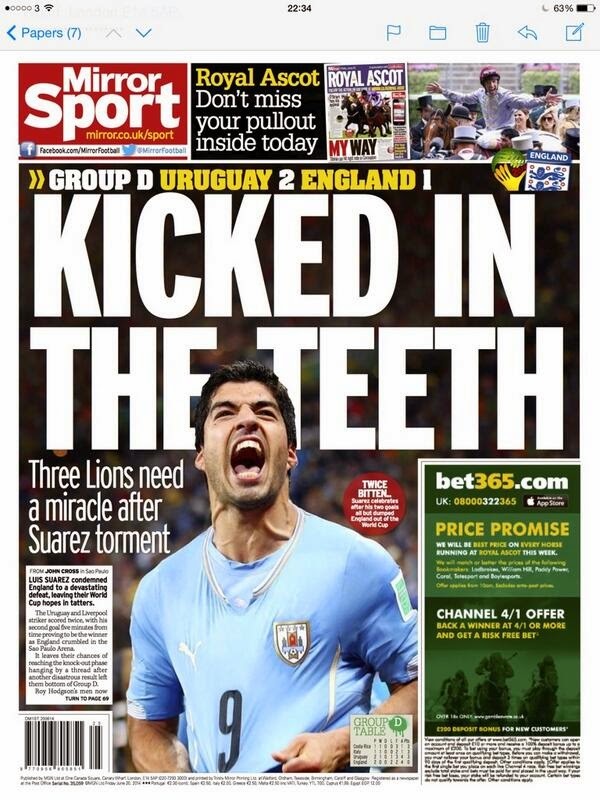 Kicked in the teeth screams the headline over a cutout of Suarez's gnashers in full glory. Very strong. The Daily Express also sums the evening up pretty well. 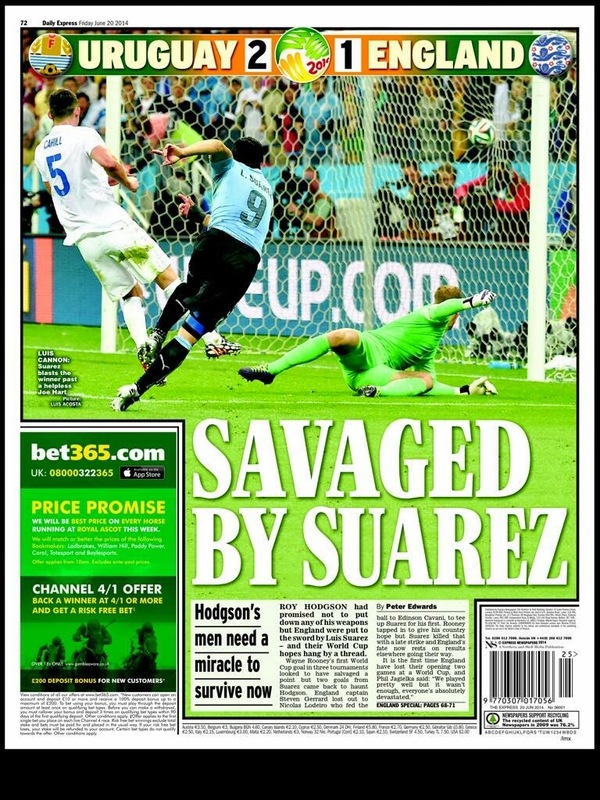 Savaged by Suarez is a powerful headline under the picture of the striker beating Joe Hart for his second goal. 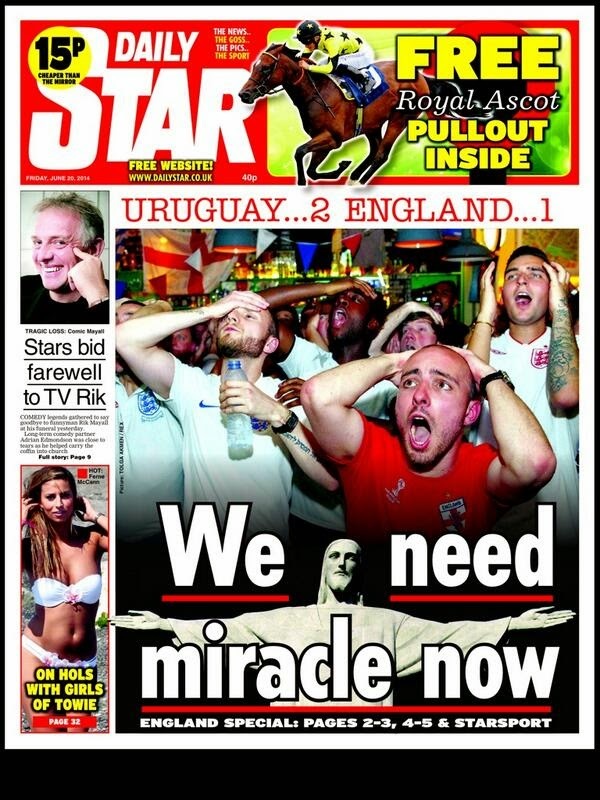 The Daily Star has an unlikely tie-in of despairing England fans in a bar and the statue of Christ the Redeemer. The headline says We need miracle now. The supporters appear to be drinking water ... so, who knows, maybe miracles are possible. 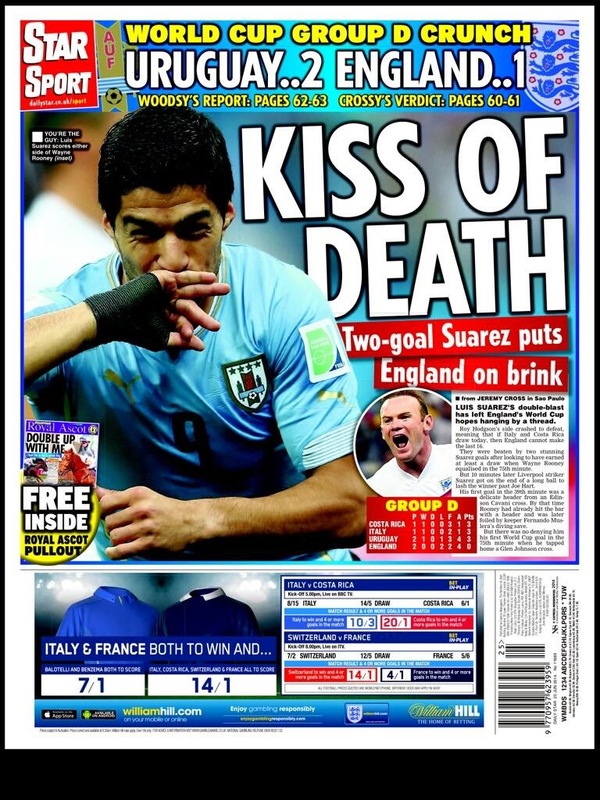 The back page uses the picture of Suarez kissing his hand ... with the right headline. 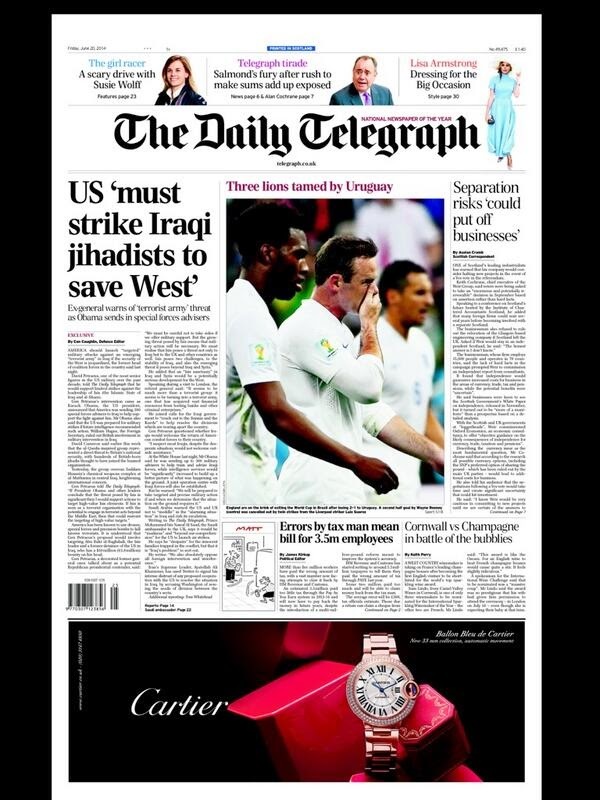 The Daily Telegraph uses a tame picture of three tamed lions on the front. Its sports section is good though - a subtle two word headline that captures the plight of English football and a powerful picture well used. 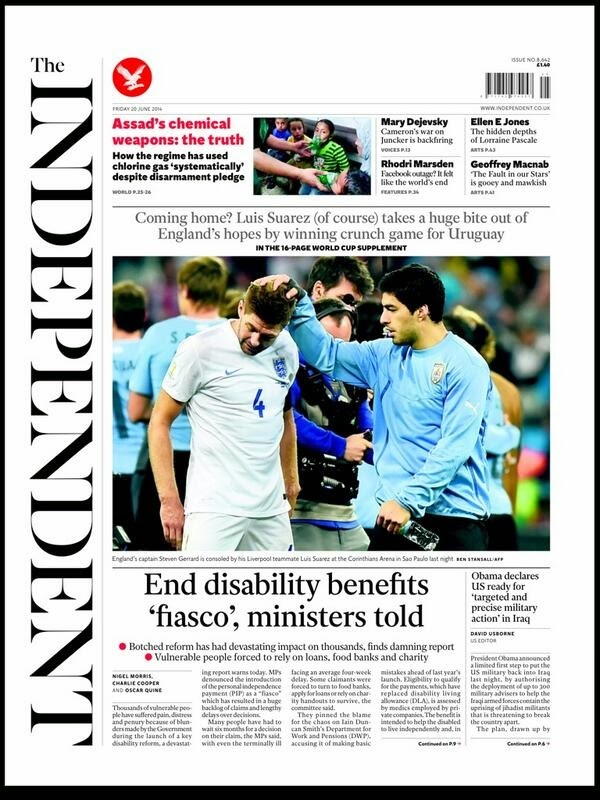 The Independent uses a picture of two Liverpool team-mates at different extremes of emotion. The bite theme, once again, makes its way into the headline. Independent sport looks like a magazine cover ... no fear of white space here. Straight headline and picture. 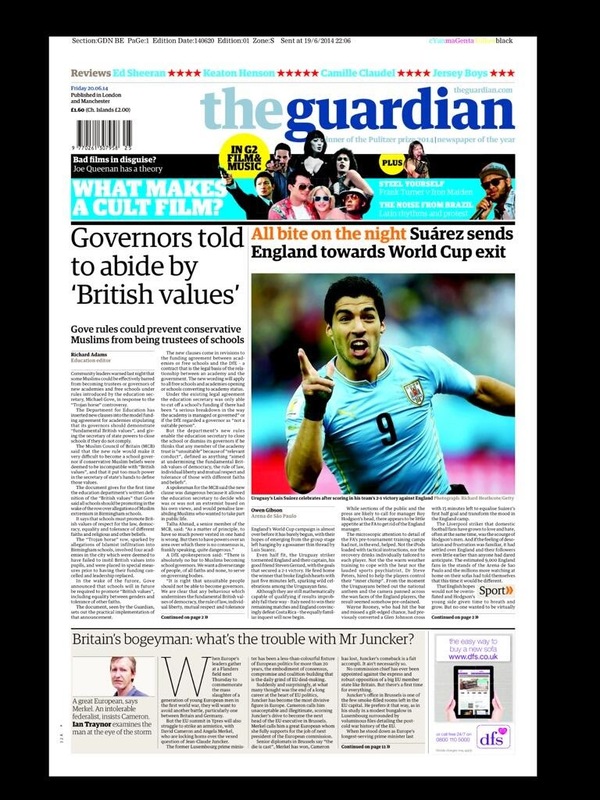 Suarez makes it on to Page 1 of The Guardian under the rather tabloid headline All bite on the night. 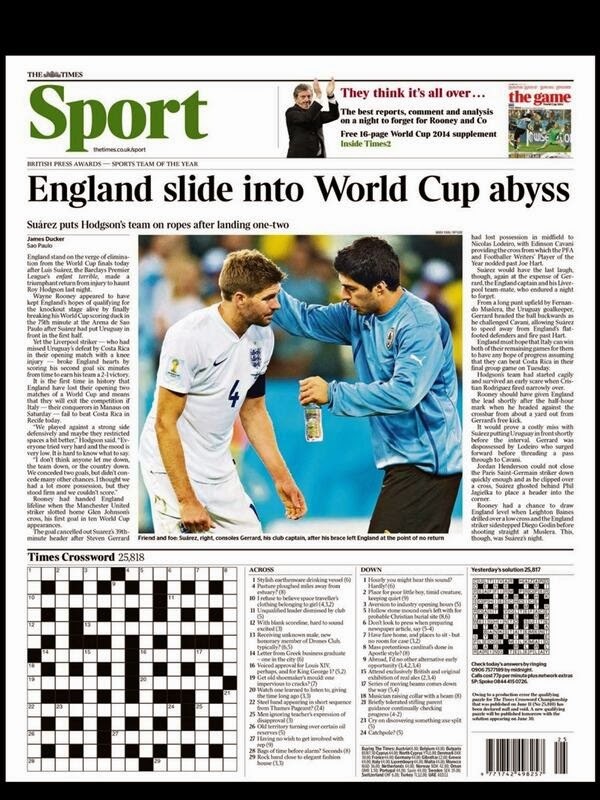 The Times has despairing fans on the front - with just a caption - while the back page uses Suarez consoling his club captain. Abyss is a powerful word. I watched the game in a bar in Dublin where the RTE pundits reckoned England's demise was all down to the fact that 'they wouldn't kill their grannies' ... whereas the Uruguayans clearly would. It made a pleasant change from the monotonous ITV line-up. Small mercies. 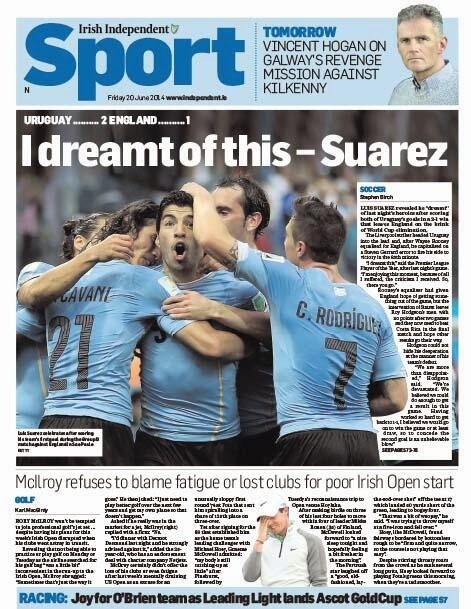 Anyway, as I am working with the Irish Independent ... here is its back page. 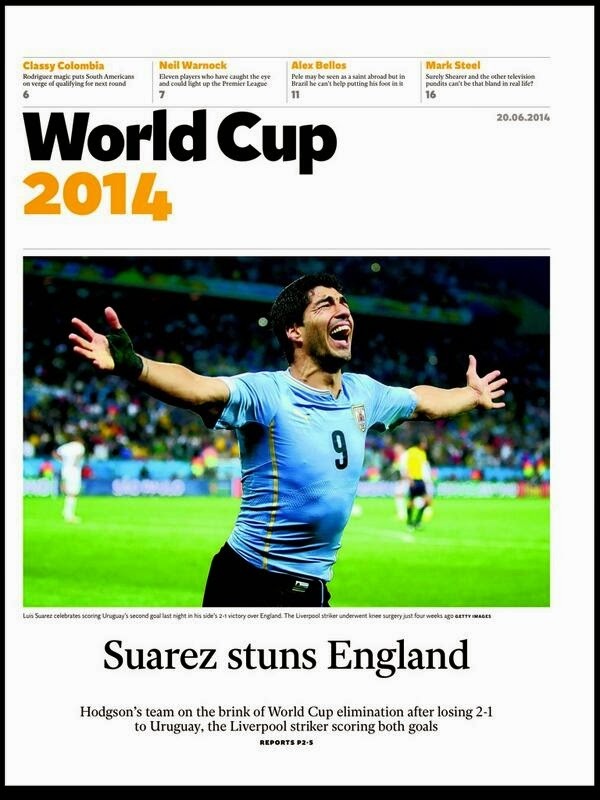 I had hoped to be reading papers that were triumphant, with bold pictures of Rooney and Sturridge punching the air. Instead I give you a gloomy set of pages showing a mix of frustration and grudging respect for a first rate performance by Luis Suarez. Well done to the sport desks - once again good pages turned around at break-neck speed.